292 pages | 3 B/W Illus. The extension of border controls beyond a country’s territory to regulate the flows of migrants before they arrive has become a popular and highly controversial policy practice. Today, remote control policies are more visible, complex and widespread than ever before, raising various ethical, political and legal issues for the governments promoting them. 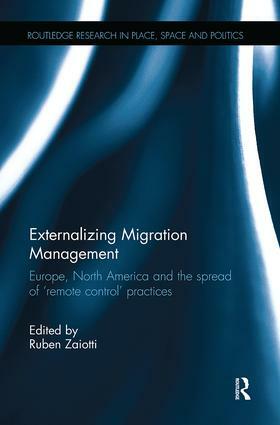 The book examines the externalization of migration control from an interdisciplinary and comparative perspective, focusing on ‘remote control’ initiatives in Europe and North America, with contributions from the fields of politics, sociology, law, geography, anthropology, and history. This book uses empirically rich analyses and compelling theoretical insights to trace the evolution of ‘remote control’ initiatives and assesses their impact and policy implications. It also explores competing theoretical models that might explain their emergence and diffusion. Individual chapters tackle some of the most puzzling questions underlying remote control policies, such as the reasons why governments adopt these policies and what might be their impact on migrants and other actors involved.